I am late to this book party, but let me explain. I get twitchy about medical stuff. Earlier this year I had to abandon Rosemary Mahoney's book about the blind because it described an eye surgery. I have never been able to finish Dr. Atul Gawande's "Complications" because of its description of medical procedures. It was a small miracle that I was able to finish the first "Call the Midwife" book, because I hate childbirth scenes. So, with a deep sigh, I started reading. And then, oh happy day, my fears turned out to be unfounded because I ended up really liking the story. Rebecca Skloot wrote that she first heard about Henrietta Lacks and her immortal cells in a community college biology class. Lacks was a black woman who died in 1951 from cervical cancer. Before she died, a surgeon at Johns Hopkins Hospital took samples of her tumor and put them in a petri dish. A key part of this story is that Henrietta did not know her tissue had been taken, and doctors did not tell her family, either. "Scientists had been trying to keep human cells alive in culture for decades, but they all eventually died. Henrietta's were different: they reproduced an entire generation every twenty-four hours, and they never stopped. They became the first immortal cells ever grown in a laboratory." "The reason Henrietta's cells were so precious was because they allowed scientists to perform experiments that would have been impossible with a living human. They cut HeLa cells apart and exposed them to endless toxins, radiation, and infections. They bombarded them with drugs, hoping to find one that would kill malignant cells without destroying normal ones. 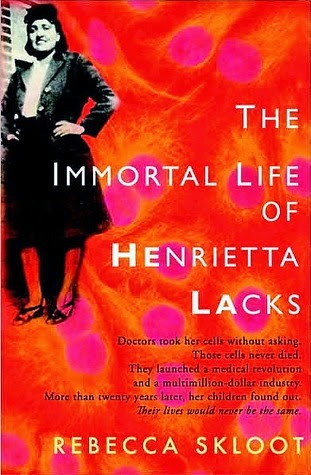 They studied immune suppression and cancer growth by injecting HeLa cells into immune-compromise rats, which developed malignant tumors much like Henrietta's. If the cells died in the process, it didn't matter -- scientists could just go back to their eternally growing HeLa stock and start over again." "There's no indication that Henrietta questioned [her doctor]; like most patients in the 1950s, she deferred to anything her doctors said. This was a time when 'benevolent deception' was a common practice -- doctors often withheld even the most fundamental information from their patients, sometimes not giving them any diagnosis at all. They believed it was best not to confuse or upset patients with frightening terms they might not understand, like cancer. Doctors knew best, and most patients didn't question that. Especially black patients in public wards. This was 1951 in Baltimore, segregation was law, and it was understood that black people didn't question white people's professional judgment. Many black patients were just glad to be getting treatment, since discrimination in hospitals was widespread."